Somewhat surprisingly, there is currently no common definition or approach to the protection of trade secrets across the EU. This is in contrast to, for example, the United States, which has for some time applied state-level and, more recently, federal-level protection to trade secrets. The scope of protection for trade secrets in the EU depends entirely on the extent to which a trade secret is protected by local Member State laws regarding confidential information, trade secrets and unfair competition. To remedy this position, in 2016 the EU introduced the (admittedly, rather wordy) “Directive 2016/943 on the protection of undisclosed know-how and business information (trade secrets) against their unlawful acquisition, use and disclosure” (“the Trade Secrets Directive”). This is news at the moment because the Trade Secrets Directive is due for implementation by Member States by 9 June 2018. The most basic implication arising from the Trade Secrets Directive is that from June 2018 there will be an EU-wide concept of a new type of intangible asset, namely, a “trade secret”. 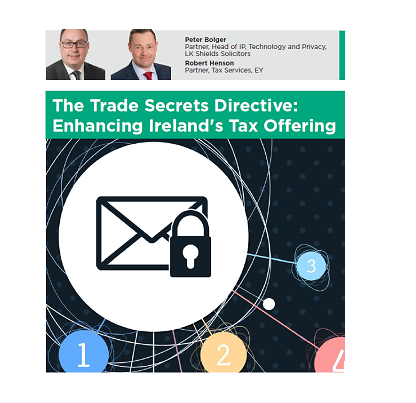 Before explaining the approach taken by the Trade Secrets Directive to defining a trade secret, some context about the current legal position in Ireland may be helpful. At the outset, there is no definition of trade secrets in Irish law. To be protected in Ireland a trade secret would have to be considered “confidential information”, which is protected by the law of confidence (or by contract, if a non-disclosure agreement has also been used). Confidential information itself is not defined. At the risk of over-simplification, confidential information is information that has the “necessary quality of confidence” about it and that is disclosed in circumstances importing an obligation of confidence. This means that a variety of types of information are protected, an ill-defined subset of which are trade secrets. Perhaps the most famous example of a trade secret is the legendary recipe for Cola-Cola, which will retain its value for so long as it is successfully kept secret. Is a Trade Secret a Form of Intellectual Property? Trade secrets, and other forms of confidential information such as know-how, R&D data and customer lists, are very valuable assets (for so long as they are kept secret) but are not necessarily protected by intellectual property rights in the traditional sense. Of course, in appropriate cases they may be patentable, giving rise to a choice to patent the relevant trade secret (which protection is necessarily limited in time) or keep it private (potentially forever). Copyright and related rights will offer only limited, if not impractical, protection; this will depend on a case-by-case review. Therefore, for large swathes of private or confidential information, keeping it secret is a legitimate approach to add significant value to an organisation. Like traditional intellectual property rights, the protection of trade secrets and confidential information is intended to act as an incentive for parties to conduct research and development and innovate in a competitive but secure environment. In recognition of their importance to business, tax relief through the “specified intangible asset” regime under s291A of the Taxes Consolidation Act 1997 (TCA 1997) can be available for capital expenditure incurred on the acquisition of certain intangible assets for the purposes of a company’s trade. The scheme applies to a broad range of intangible assets, including secret processes, customer lists,1 know-how2 and other secret information that are recognised as such under generally accepted accounting practice3 and listed in s291A(1) TCA 1997 as a ‘specified intangible asset. Tax relief under the scheme is by way of treating the intangible asset as plant or machinery, with wear-and-tear allowances being available based on the amortisation or impairment in respect of the intangible asset charged to the company’s profit and loss account or income statement for the accounting period or, if the company so opts, over a fixed period of 15 years at an annual rate of 7% for 14 years and 2% in the final year. The aggregate amount of relief available is capped at 80%4 of the trading income of the relevant trade for the accounting period for claims made in respect of capital expenditure incurred on a specified asset on or after 11 October 2017. For internally generated trade secrets, tax relief may be available through the research and development (R&D) tax credit regime. The R&D tax credit can be of significant benefit to companies as it is calculated at 25% of the qualifying expenditure and is available for offset against a company’s current and preceding year’s corporation tax liability, with any further excess being refunded by Revenue in three instalments over a period of 33 months. How Is a Trade Secret Defined? There were various factors to be taken into account when drafting the definition of trade secrets for the purposes of the Trade Secret Directive. The Trade Secrets Directive has adopted this definition for the EU. This definition is in line with but not identical to the (rather more snappy) US Uniform Trade Secrets Act (state level) and the Defend Trade Secrets Act (federal level). From a tax perspective, although it is expected that most “trade secrets” would typically fall within the definition of “specified intangible asset” contained in s291A TCA 1997, this should be examined on a case-by-case basis as, for example, para. (g) of the definition of “specified intangible asset” in s291A TCA 1997 is limited to “secret processes, or formulae or other secret information concerning industrial, commercial or scientific experience…”. Further, this is linked to the availability of the exemption under s101 Stamp Duties Consolidation Act 1999 on the transfer/acquisition of a trade secret, which can be a significant tax benefit, given the increase in stamp duty rates to 6% in the Finance Act 2017. Without going into the detail, the Trade Secrets Directive sets out the conditions for the lawful and unlawful acquisition, use and disclosure of trade secrets; exceptions to protection; and the conditions for the preservation of confidentiality of trade secrets in the course of legal proceedings. Helpfully, the Trade Secrets Directive calls out that the protection of trade secrets offers no ground for restricting employee mobility; does not limit an employee’s use of information that is not a trade secret; and does not limit an employee’s use of experience and skills honestly acquired in the normal course of his or her employment. Unhelpfully, the Trade Secrets Directive is also in part a missed opportunity. It does not call out the legal nature of a trade secret, or set out common rules on the transfer and licensing of trade secrets across the EU. It is hoped that the Irish legislature will provide for these gaps in any Irish implementing legislation. The Trade Secrets Directive puts the EU on a level playing field with the US. That said, US companies have years of experience of applying trade secret protection to their business operations and, where necessary, enforcing trade secrets. It will now be important for Irish and European businesses to apply the Trade Secrets Directive to their own operations to ensure appropriate, and pan-European, protection. Many businesses are, as a result, now carrying out trade secrets audits. 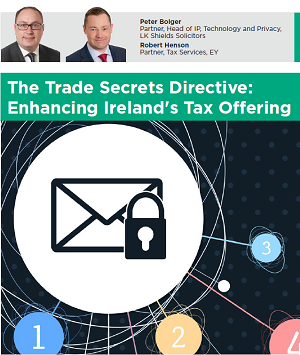 At the time of writing, it remains to be seen to what extent Ireland implements the Trade Secrets Directive versus taking the view that it is already protected under the law of confidence. What is certain is that the Trade Secrets Directive harmonises a new pan-EU intangible right that will only continue to help Ireland’s growing reputation as the location of choice for on-shoring of intellectual property and innovation.